My colleagues and I that own legitimate, long-standing (over 5 years) solar energy companies have recently noticed an alarming trend. This trend is that new so-called solar integrators are springing up faster than those pesky weeds we deal with throughout the summer. Many of these are construction companies, real estate companies and electricians whose businesses are having a hard time coping in this economy. We do not begrudge anyone from making a living, however we do not condone half-truths and misrepresentation of the facts. I have seen first-hand companies describe themselves as an “experienced” solar energy company, “experts in the solar field,” that have no more experience than you do. They may have 20 years experience in construction or electrical work, however that does not qualify them to place a system on your roof. Some have taken 2 day courses on solar installation or online courses. That hardly qualifies a company to proclaim they are "solar experts". Ask them directly, "How many Solar PV installations has your company installed and where are the projects located?" Also, find out if you can call former clients for references. I heard a startling statement the other day that there have been hundreds of failed inspections. That means that YOUR REBATE can't be processed, no SRECS, and no meter going backwards. We have had an above average amount of service calls for systems that stopped functioning because of inept installs. The company is either not willing to fix them or are not even around anymore. Think before you buy. Do you really want to trust your expensive, sophisticated system, not to mention your roof, to be installed by someone that does not know what they are doing? Would you go to a family doctor for a heart operation? I don't think so. So how do you know? Check out www.njcep.com and search for vendors or use http://www.njcleanenergy.com/findavendor Click on Residential or Commercial listings. If the company is not on this list, take a pass. If you can't get at least 3-5 references, take a pass. You can also look at: www.findsolar.com. Look for Date of Registration and the amount of kW's installed. Dealing with the right company will provide the best experience in the short and long run. Check the copyright date on the company’s website. Scroll down to the bottom of the homepage. More than likely that will tell you the year the company was started. When you see a solar array on an orange tiled roof, more than likely this company does not have a job of their own. These are stock photos taken of systems installed in California. Buy local…buy safely. 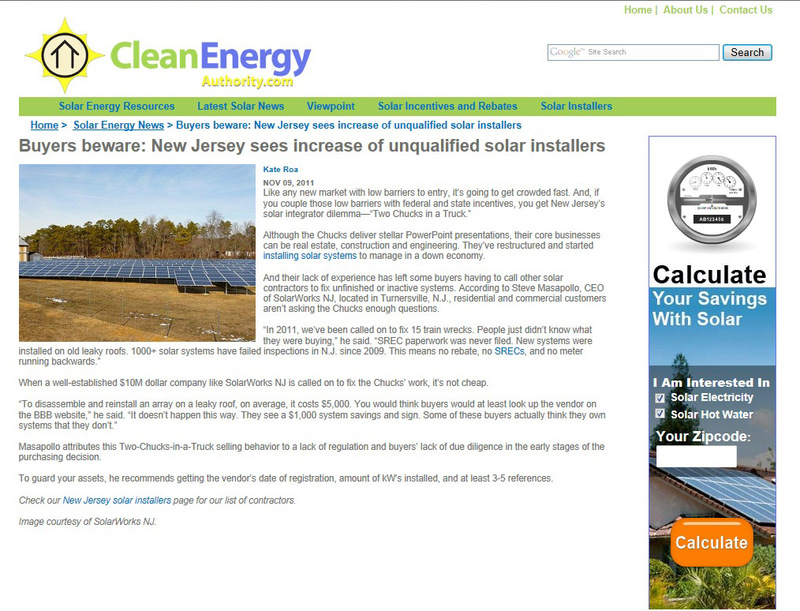 Click here to visit Clean Energy Authority's website.